Rock ‘n’ Gold scored by two lengths over favourite Manolo Blahniq in the John Dillon Stakes. Trainer Mat Ellerton has praised the initiative shown by jockey Damian Lane, who helped eight-year-old gelding Rock ‘n’ Gold to a frontrunning stakes race victory at Caulfield. 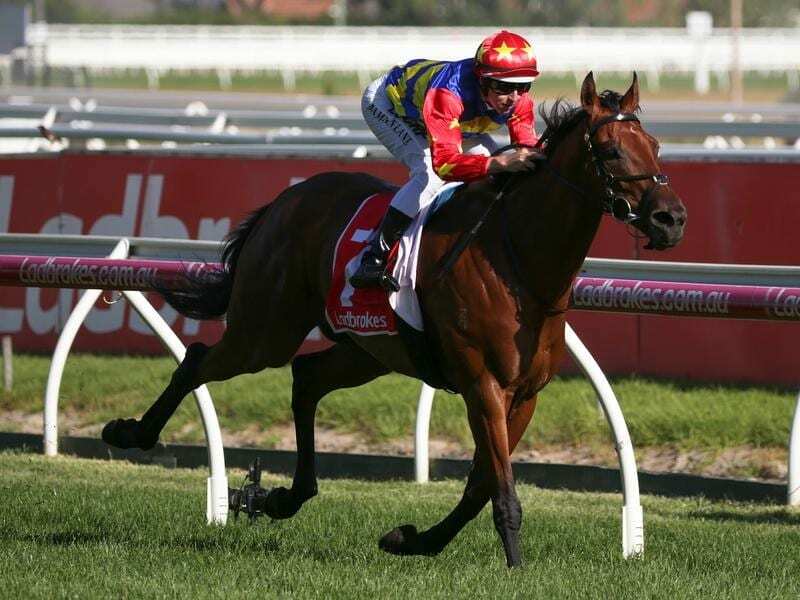 Lane opted to press forward not long after the start of Saturday’s Listed John Dillon Stakes (1400m) aboard Rock ‘n’ Gold, who assumed control of the race before kicking away when it mattered most in the straight. Rock ‘n’ Gold ($17) scored by two lengths over $2.80 favourite Manolo Blahniq, who was held up for clear running at crucial stages in the straight. Manolo Blahniq stormed through along the rail late in the race to grab second, a short head in front of Chamois Road ($21). “I think Damian went to plan B,” said Ellerton, who trains in partnership with Simon Zahra. The win was Rock ‘n’ Gold’s second from his past three starts having scored in similar fashion at Caulfield on December 26 before a luckless run in the Chester Manifold Stakes at Flemington. “He’s a durable horse,” Ellerton said. “He’s loving his racing and he enjoys his time in work. Lane said when Rock ‘n’ Gold began cleanly and there was not as much speed up front as he had anticipated, he let the eight-year-old stride. “He was too good,” Lane said. “It was a mess at Flemington last start when he bombed the start and was stuck back on the rail. Victoria’s premier trainer Darren Weir had a winning double at the meeting, which was brought up by Silentz in the Ladbrokes Odds Boost Handicap (1700m). Silentz ($1.90) notched his third straight city win, beating Guizot by one length, to take his overall record to eight wins from 17 starts. The Weir-trained Social Spin had earlier pressed his claims for better-class three-year-old races with a 1-1/2 length victory under a big weight in the Catanach’s Jewellers Handicap (1400m).